Many precious old photographs will fade, crumble and disappear and their valuable memories lost forever if they're not properly restored. So before this happens, bring these photos to Titan Professional Photo Lab for scanning, retouching and printing. Old color photos often are so weak that the people and places within are almost indiscernable. We start by scanning your negatives, slides or prints to the highest possible industry standards. These scanning techniques are necessary to salvage every bit of information remaining on your images. The next step is to send the files to the computer artists who evaluate and enhance your photos to the absolute highest level of quality possible. Many color photos and negatives are lacking in color fidelity, so we have to adjust and color balance these images to return them to their original charm. 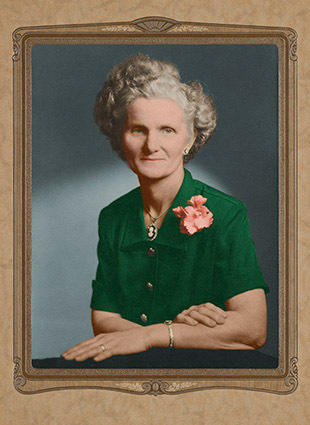 Many people want their old black and white photographs to be colorized which gives these photos the look of old fashioned hand tinted photos. The things we can do are almost endless. So stop by and talk to us about your specific needs. Download our price list, email or call us for more information.